On this day, 21 January 1974, protestors demonstrating against the government of Premier Gairy were confronted by Police and Police Aides, resulting in the death of Rupert Bishop and injury to others. Like Grenada’s Independence this year, it also marks 45 years. On 21 January 1974 Premier Gairy sent his Police Aides to “harass” demonstrators at Otway House on the Carenage who were demanding, among other things, an end to police brutality and the illegal harassment by his paramilitary forces. For the previous few months, following a number of confrontations between Premier Gairy and his political opposition, the island had become politically divisive. The impending Independence from the United Kingdom under the government of Eric Gairy was probably the most divisive issue! The immediate events that culminated in Bloody Monday were set in motion when the Committee of 22 threatened Premier Gairy’s government with a nation-wide labour strike if he did not comply with their recommendations to disband his Police Aides, and investigate and bring to justice those who were responsible for the beatings on Bloody Sunday where Maurice Bishop and a number of others were severely beaten. After initially agreeing to the Committee’s recommendations and establishing a Commission of Inquiry, Premier Gairy reneged on the remaining conditions and the Committee of 22 decided to resume the nation-wide labour strike on 1 January 1974. The strike resulted in the complete shutdown of the country, including schools, businesses and the central port, leaving the Gairy government few political alternatives. Governor Hilda Bynoe became a casualty of the political crisis as she felt she had no choice but to resign as head of the government in the wake of the mass protests that called for her to leave. On the morning of 21 January Dame Hilda and her family left Grenada and the chaos erupted. What resulted after the blood and broken glass were cleared revealed the sad political and economic state the country was in. Rupert Bishop, father of New Jewel Movement leader Maurice Bishop, was killed and others injured. The events of Bloody Monday were captured on audio tape by Grenadian journalist Alister Hughes who later relayed it to the world. The secret police, after violently confronting the demonstrators on 21 January, were said to have continued the destruction by looting some of the groceries and general stores in St George’s, an accusation the GULP government has always denied. This was viewed by Gairy’s opposition as retaliation by Premier Gairy against the businesses that struck against his government. Subsequently, the people joined them in looting and destroying some of Grenada’s prominent businesses. 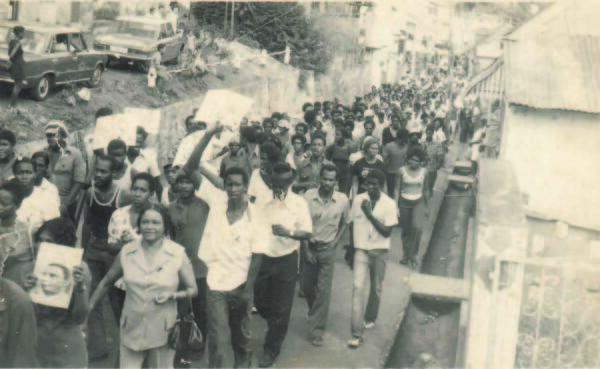 The labour strike continued for two months longer, but the opposition failed to force the resignation of Premier Gairy and forestall the attainment of Independence from the UK which was achieved under a state of emergency on 7 February 1974. The turbulent events of Bloody Sunday and Bloody Monday, representing the climax of the early political violence in Grenada, brought Premier Gairy’s disposition to circumvent the constitution and laws of Grenada to the notice of the world. The Duffus Commission rendered a severe indictment against the Grenada United Labour Party government with its investigation into the breakdown of law and order in the country.